Calf augmentation is a procedure performed to enhance the lower portion of the leg. In people with a shrunken lower leg, as a result of injury or disease, an implant can be inserted in the calf to help minimize the resultant deformity. Despite the fact that actual leg function has not been improved, the authors consider this reconstructive surgery as the goal is to help restore a more normal appearance. Some people have a naturally thin or underdeveloped calf, and despite exercise or diet, this leg remains small. These patients may request calf augmentation for pure aesthetic or cosmetic reasons. Women may desire only the medial or inner leg filled out. Body builders may want both the inner and outer lower leg filled out. Calf augmentation usually is performed by placing an implant made out of silicone rubber over the muscles, on the medial aspect of the calf. Some people, such as body builders, may require a larger augmentation, and in these individuals an implant may be placed on both the medial (inner) and lateral (outer) aspects of the calf. Exact numbers are impossible to obtain, but calf augmentation is quite common in Mexico and Central and South America. It is less common in Canada and the United States. Unfortunately, many orthopedic surgeons and family physicians who see patients with a deformed or hypoplastic leg are not aware that augmentation can be performed. 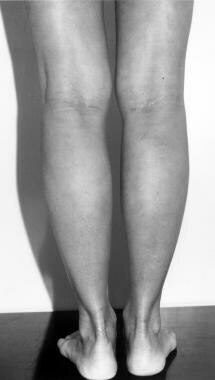 Some patients have a relative disproportion between the thigh and the calf. The legs are symmetric, the thigh is in proportion to the rest of the body, but the calf is relatively underdeveloped. These patients simply want their legs built up to be more in proportion with the rest of their body. Body builders want to augment the gastrocnemius muscle on the inside and outside since that muscle does not become bulky in some individuals. In a patient who desires cosmetic augmentation, the indication for calf augmentation is a relative disproportion between the thigh and the rest of the body and the calf. The patient with a hypoplastic leg often has other coexisting deformities. A significant discrepancy of the leg length and/or bone volume may exist, deformities of the foot and ankle may be present, and even the skin and soft tissues may be relatively hypoplastic. These patients often have had multiple surgical procedures on the lower leg, which may limit size or placement of the implant. This is especially common in patients with polio or congenital foot deformities. Warn these patients that in most situations, exact symmetry is not achieved but a significant improvement can be made, and the defect may not be obvious to the casual observer. The implant is placed on the medial surface of the superficial posterior compartment of the leg, which contains the gastrocnemius, soleus, and plantaris muscles. Enter this compartment through an incision in the popliteal crease, dividing skin and subcutaneous fat and incising deep investing fascia of the leg, which is thickened to form the popliteal fascia on top or bottom of the fascia. The semimembranosus and the more lateral semitendinosus tendons lie superficial to the medial head of the gastrocnemius muscle and must be retracted medially. The lateral borders of the popliteal fossa, biceps femoris, and lateral head of the gastrocnemius muscles are encountered if augmentation is carried out more laterally with a second implant. The thin fascia overlying the gastrocnemius muscle is identified, and the raphe that separates the two heads of the gastrocnemius muscle is often visible. The implant should be resting on the medial gastrocnemius muscle and its epimysium. The short saphenous vein runs in the mid line posteriorly, deep to the deep invested fascia and along the superficial surface of the gastrocnemius muscle. It enters the popliteal vein higher up in the popliteal fossa. Care must be taken not to damage this vessel or the medical sural cutaneous nerve. Some surgeons place the implant behind the muscle. Anterior to the point of approach lies the long saphenous system, with which the surgeon should not interfere. Contraindications to calf augmentation include unrealistic expectations, severe medical problems, and compromised circulation to the skin and soft tissues of the lower leg. Assess the patient's goals and expectations. If a patient who is a body builder desires the insertion of too large an implant and the surgeon feels this cannot be achieved without creating too much internal pressure in the leg, the patient should be discouraged from undergoing the procedure. 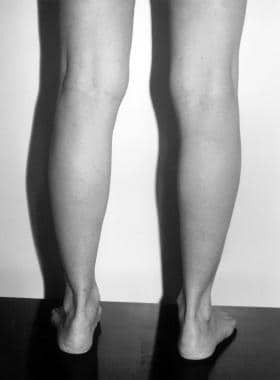 Similarly, a patient with a hypoplastic leg who thinks that the postpolio leg can be reconstructed to look like the normal leg is also not a candidate for the procedure. Obviously, patients who have circulatory problems or other severe medical problems pertaining to the legs should not undergo the procedure. Glitzenstein J. Correction of the amyotrophies of the limbs with silicone prosthesis inclusions. Rev Bras Cir. 1979. 69:117. Pereira LH, Nicaretta B, Sterodimas A. Bilateral calf augmentation for aesthetic purposes. Aesthetic Plast Surg. 2012 Apr. 36 (2):295-302. [Medline]. Montellano L. Calf augmentation. Ann Plast Surg. 1991 Nov. 27(5):429-38. [Medline]. Carlsen LN. Calf augmentation--a preliminary report. Ann Plast Surg. 1979 Jun. 2(6):508-10. [Medline]. Aiache AE. Calf implantation. Plast Reconstr Surg. 1989 Mar. 83(3):488-93. [Medline]. Pereira LH, Nicaretta B, Sterodimas A. Bilateral calf augmentation for aesthetic purposes. Aesthetic Plast Surg. 2012 Apr. 36(2):295-302. [Medline]. Mundinger GS, Vogel JE. Calf Augmentation and Reshaping with Autologous Fat Grafting. Aesthet Surg J. 2016 Feb. 36 (2):211-20. [Medline]. Gutstein RA. Augmentation of the lower leg: a new combined calf-tibial implant. Plast Reconstr Surg. 2006 Mar. 117(3):817-26; discussion 827. [Medline]. Calf augmentation. Fascia on top of muscle.